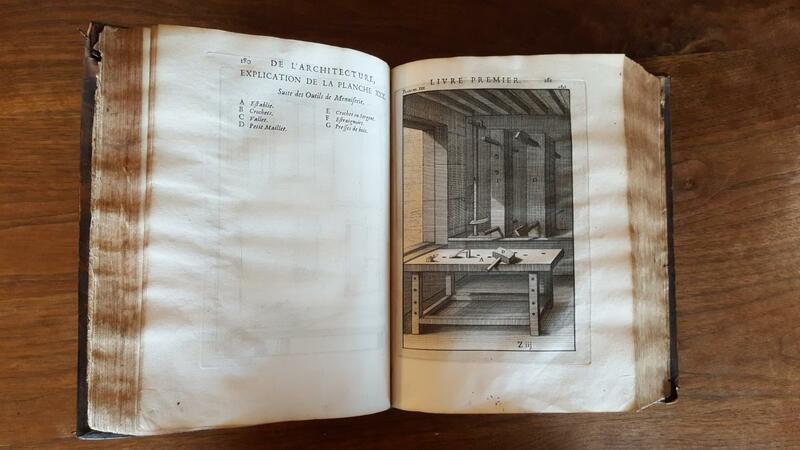 For over a decade I've been looking for a copy I could afford of Andre Felibien's masterwork, "Des Principes de l'Architecture, de la Sculpture, de la Peinture et des ..." [Principles of Architecture, Sculpture, Painting and ..] A copy finally popped up on the internet and I grabbed it. I have been spending the last week studying it. The book is well known, and you can get a scan on Google books here. I collect books. While it's wonderful to be able to read the book online from practically anywhere, I find having a real book in front of me is far more satisfying. 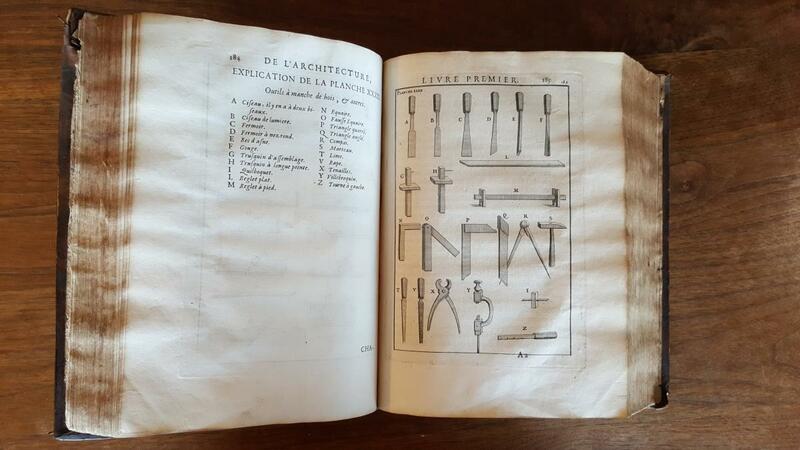 The book's woodworking section starts at page 170, with all the plates are in the following pages. There are several editions of the book, the first from 1676. 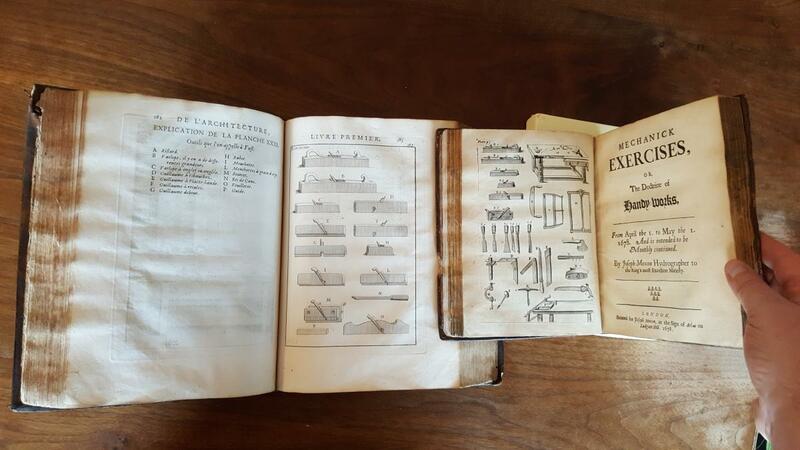 This is the book that Joseph Moxon used to copy drawing from when he published the woodworking section of "Mechanick Exercises" two years later in 1678. If you haven't read Moxon, we stock the Lost Art Press version, or you can read the 1703 third edition here. Moxon's "Mechanick Exercises" is important because it is the first book in English that tries to be a handbook on how to make things. 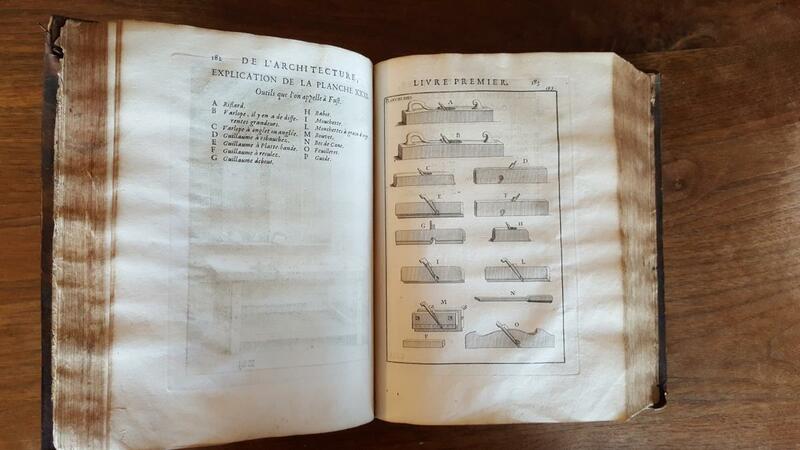 Beginning in 1677, every few months or so Moxon released a chapter on a different subject. Blacksmithing, carpentry, house-righting were a few of the topics. In 1683, after a hiatus of several years while England was in turmoil, Moxon resumed the series, this time writing about something he know about personally: printing and typemaking. Whereas Felibien's book was really an encyclopedia of tools and objects - this is a hammer, this is a nail - Moxon pioneered the "How-to." The point of Felibien's book, in my view, was to give rich, educated people the ability to find out the basics of the world around them. Studying Plato at University was fine and dandy, but an educated person should not be confused by the real life going around them. Moxon took it a step further. "Mechanick Exercises" tells a little about the tools; instead, it instructs. Here is the way to grind a tool, how to chop a mortise, etc. Fairly short in length, and written by someone who was far from an expert or a craftsperson in anything except printing, the book falls short of being comprehensive. But Moxon gets full marks or trying, and it's exciting to read his result. It is pretty obvious - and has been known for a long time - that Moxon used Felibien as a source for all his tool illustrations. Seeing the original engravings started me thinking. First of all, if Moxon's book used French pictures, then one can assume that what is in Moxon are actually drawings of French tools. And in fact, many of the few surviving English tools from that era look different than the tools illustrated in Mechnick Exercises. Another point I am pondering: the vise that we now call a Moxon Vise is hanging off in space on the side of the workbench, but are shown much larger hanging on the wall in Felibien's workshop. I love my Moxon Bench because the modern incarnation sits on top of my bench, raising the height for dovetailing and other joinery. But Moxon doesn't mention it in the text and neither book shows the vise in a modern usages. Felibien calls it a wood press, or vise, but that's doesn't help much, although the size of the vises in his book suggest that they were used for clamping things together, not as a vise raiser. Probably the most obvious conclusion I can reach from comparing the photos is that Moxon really did a crappy job. The images are all crammed together on one plate, and two of the tools - the workbench and the frame saw - are cut off at the edge. The engravings are crude compared to Felibien's. How were the engravings done? And who was the engraver? We really don't know. At the time of publication, Moxon was a successful printer so he would have had staff, but he also probably had enough skill to do the not-so-great engravings himself. I consulted by phone with my friend Jeff Peachey, a noted book conservator (who hasn't seem this copy in the flesh yet) His guess is that the engraver (whoever it was) just propped up the Felibien up and then directly sketched out the tool images on the copper plate. This would explain why the images are all reversed in the final print. We suspect the engraver might have used some sort of optical aid to help with the copying on some of the images. Moxon's image are greatly reduced in size from the original French ones, probably because he was trying to fit about 4 pages of tools onto one smaller page. That being said, and the reason why I suspect the involvement of an aid of a sort, is that planes drawings are a pretty good copy of the original image, but one of the saws is missing a little off the right side. The problematic saw would have been the last one engraved if the engraver worked from left to right (as you would if you were right handed). I think that if he was drawing freehand and just using the book as a reference he would have scaled it to fit. As it is it looks like he was in a rush, started off doing a pretty good engraved copy, but then ran out of space. Some of the smaller tools are pretty crude, as if he didn't see the need for a careful copy. The biggest change from Felibien is on the workbench. The wood press on the wall became something hanging in front of Moxon's bench. One interesting fact is that Moxon's bench has a hook front on the left and Felibien's doesn't. This suggests that Moxon might have copied the images but he was trying at least on some level to do more than just condense and copy a picture. While I find the facts of the case interesting, and speculation on how the books came about fun, the real thrill for someone like me who loves history is just seeing these real-live books together. 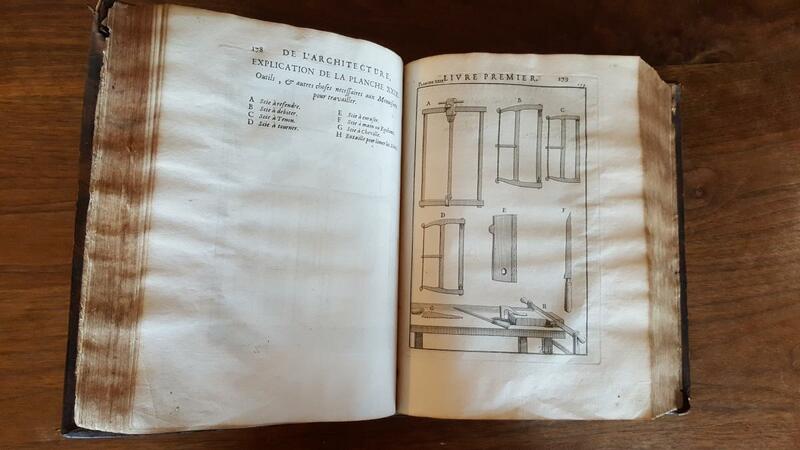 We don't know for sure how Moxon got the idea for "Mechanick Exercises," but I can tell you it is very possible that being a printer he had a copy of the French book soon after publication in 1676 and got the brainwave to take it one step further. I know when I was looking at Felibien and starting to understand some of the text, I found myself wondering: Okay, I know it's a woodpress, but describing it isn't enough. How do you use it? And, nice chisels! What do you use them for? I guess that's the same question Moxon asked himself. But unlike me, he got off his duff and published a book about it. Very interesting insights.Could it be that Félibien's encyclopedia was just meant to capture the things, not the how to just as Diderot et Dalembert's did? Don't get me wrong, I love my "Moxon" vise atop my bench, using it as Chris Schwarz presents it, but I'm not sure it being a benchtop fixture was as common as we might think. The historical images I see are either an entire double-screw bench (ye aulde Workmate) or on the front of the bench for edge-jointing. "The point of Felibien's book, in my view, was to give rich, educated people the ability to find out the basics of the world around them. Studying Plato at University was fine and dandy, but an educated person should not be confused by the real life going around them." Ottoman princes, in addition to all the things one would expect princes of a vast empire to learn, were required to master a craft.